On this page you can find our indicator's new features. Our clients can download the latest version here with a valid username. Reports about optimization and minor bugfixes will not appear here, as it's obvious that we're working on them continuously. IMPORTANT: The current version will run under 1090 build (or later) Metatrader 4 (Install instruction). Alert event if the oscillator trendline indicator (RSI, CCI, etc.) 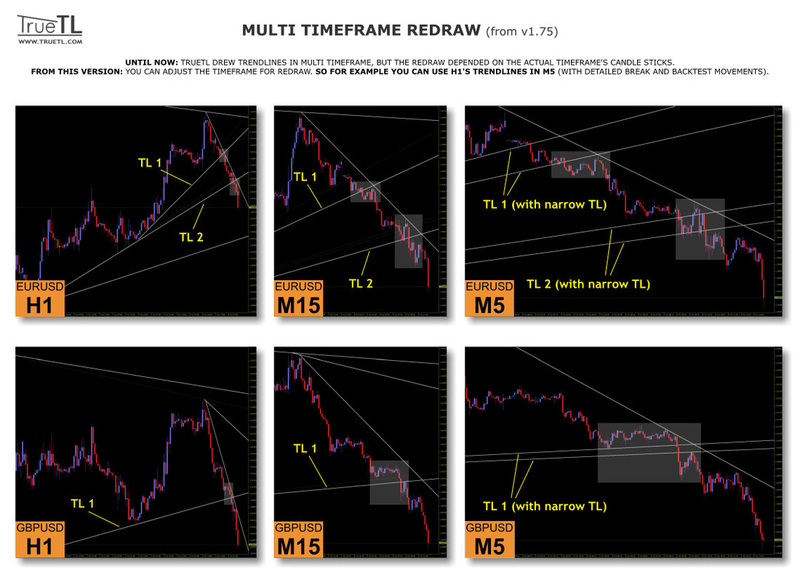 redraw and new trendline is appeared. Alert event if the True S/R Level indicator redraw and new level is appeared. 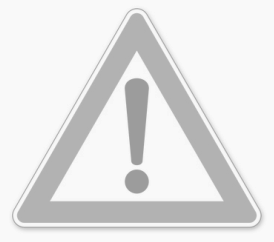 From now all indicators are able to write the alert message to csv file with delimiter. 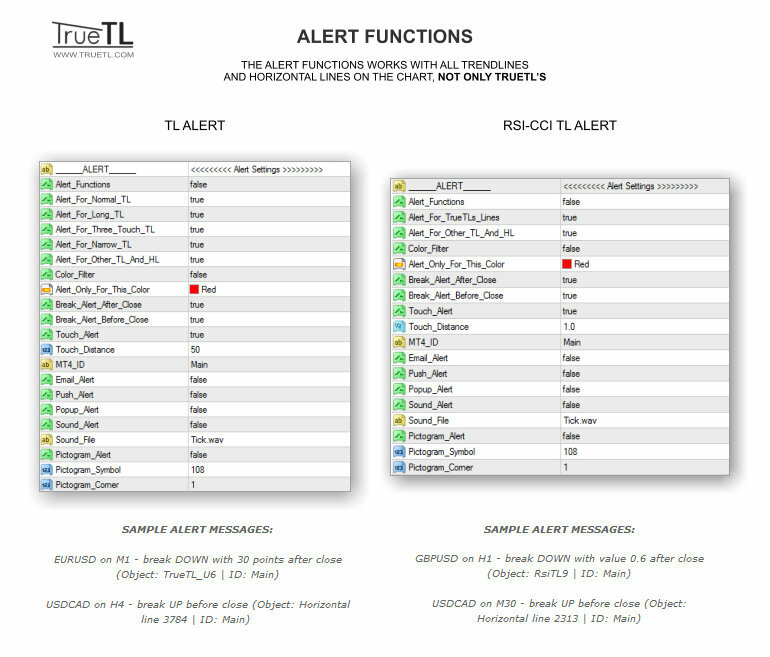 "TrueTL Alert.csv" file is placed in "MQL4/Files" folder. You can adjust forward and backward the length of the extend line (adjustable length of right side and left side). Ideal for only peak/bottom visualization. We've added Precise MTF Extend line option to see the line extension in the adjusted timeframe if You are using the indicator in MTF mode. Useful if You would like to see the higher timeframe's breakout on the actual chart's timeframe. Thanks to Metatrader's new abilities from now the divergence indicators can draw the arrows dynamically closer to the candle's high/low price on the chart. We've added Precise MTF option to the candle body and the line chart drawing mode in the True Support and Resistance Level Indicator. With this option You can see the defined timeframe's price and place on the actual timeframe's chart if You are using the indicator in MTF mode. 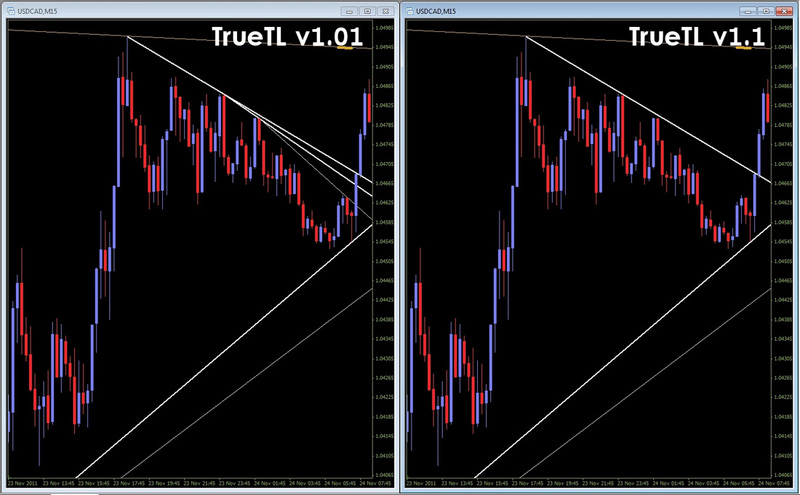 From now on all indicators contain this function what you may know from the True Trendline indicator. If the auto-scroll is disabled in MT4, and the Auto Refresh is disabled in the indicator's settings too, you can scroll back the chart, and the "[TrueTL] Calculate" script will draw all past trendlines until the last visible candle (Example Video). True Trendline Indicator sorts the trendines to 4 groups (normal, long, three touches, narrow). The style's settings are available from earlier versions but from now you can show or hide these groups separately with switchers. 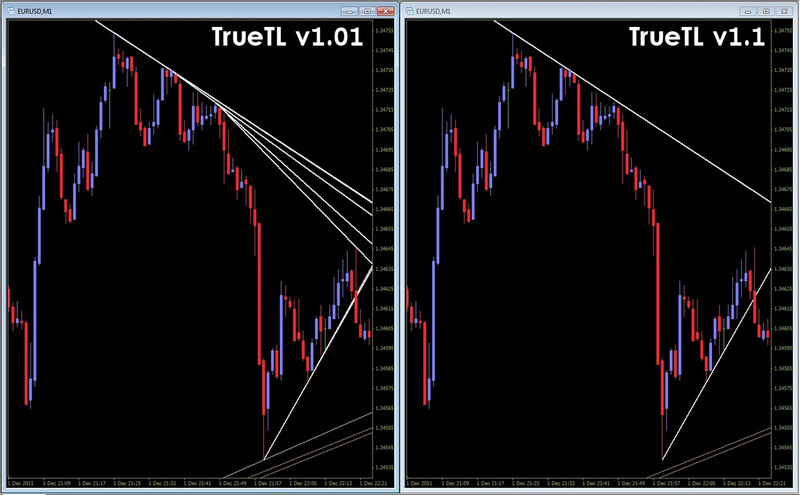 For example this function is ideal if you would like to trade with only three touches trendlines. 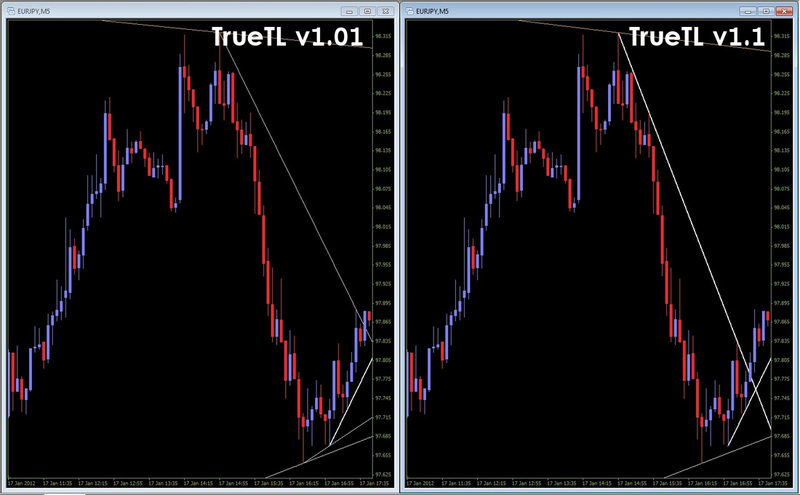 From now you can attach two or more instances of the same indicators on one chart. 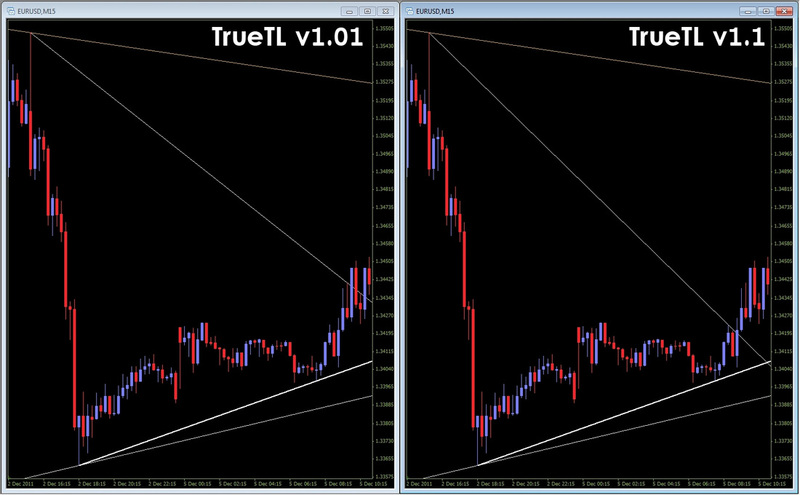 For example you can run 3 RSI Trendline indicators with different settings on one chart. If you would like to use the indicators with old-style object names (if you developed an EA or another reason) you can disable this function with the "Multiple_Instances" setting. Thanks for the Metatrader's new abilities we added user friendly description for some settings. For example: Until now the timeframe or the line style were adjustable with numbers. From now you can set them with a drop-down list options. Minor speed and stability improvements for all indicators. Some bugs what caused by MT4 are fixed and we launched new servers for the calculations of indicators. In this mode True Trendline Indicator analyses the whole chart, then selects and draws only the two nearest trendlines: upper and lower. Basically TrueTL draws all possible trendlines to use for many things: entry, entry-filtering, R/R calculation, SL / TP price, etc. The "Triangle Mode" is ideal if you are looking for an entry only. It's worth to try it out with "Lazy Redraw" option. From now, all TrueTL indicators have a simple file name without version number. If a new update is released, simply you can overwrite the indicator's files (automatically with our installer or you can do it manually from the zip file), and you can use continuosly the new indicators with your saved template and settings. The indicator settings panel's first field contains the actual version number. From now, the alert messages (license expire soon, update released, etc.) will not reserve huge place on the chart. It only shows a small icon. If you move over the mouse pointer you can read the message. You can set freely any styles of the lines (color, width, line style) in any TrueTL indicators. If you type your username into any TrueTL indicator, you don’t need anymore to type in again, because all of the indicators will remember. You can watch other timeframe’s indicator values, without switching between the timeframes. You can set timeframe of the indicator to: 0 = Timeframe used on the chart, 1=M1, 5=M5, 15=M15, 60=H1, 240=H4, 1440=D1, 10080=W1, 43200=MN1. If the main calculation server is not responding, TrueTL is going to change the settings, and requests the necessary calculation from a different server. It's proceed in the background automatically and quickly, you won't notice it. From this version, the RSI Trendline indicator shows the standard scale of RSI (0-100). You can set your favorite levels on the chart (such as 30 / 70). You can receive a notification message on the chart, such as if your subscription expire soon, or a new update is released. You have the option to set the corner on the chart to show the message. "Good bye Guardian protection..." A simple installer copies the files to the MetaTrader directory and that’s all: it works! The indicator sends the necessary candle-data to a server, which calculate some values. The indicator receive this values, and it can works only with these. This process takes place in a fraction of a second, so it’s NOT a slowing factor. WARNING: If you meet the other sources of TrueTL indicator, you can be sure that it is a fake version, and it’s not gonna work flawlessly. Click here for more information about our own ex4 protection. You can use TrueTL with multiple Metatrader account. After purchase you will receive a username which can be used on any number of any MetaTrader broker’s account. This provides faster service. On working days you can get access to the indicator up to 5 minutes. Compared to the previous version, it finds the smaller timeframe’s starting points in a much smarter way. It’s observe only those candle what is really needed, so the calculation is faster and better trendlines are also obtained.